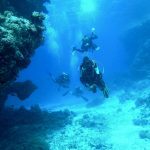 At Dive and Sea Tenerife we are happy to bring a few videos of what you can see whilst diving in Tenerife. One of our monthly video diaries in this one we saw many old faces and lots of new one’s to diving in Tenerife with Dive and Sea Tenerife. We also saw Harry and Alice complete the PADI Divemaster certification, Harry returned to Ireland and Alice stayed on for a “while” longer! Chris and George arrived to start their Divemaster internship. Lots of Rays, and all kinds of aquatic life and stunning underwater topography. Another of our monthly video diaries showing Divers and Diving in Tenerife during. A chance to get up close and personal with the beautiful Rays in Tenerife Fantastic diving in the warm waters of Tenerife. A video of one of our PADI Divemaster intern’s during her “training” with us at Dive and Sea Tenerife with some of the beautiful Ray’s and a real submarine! A fantastic video captured yesterday when a Dolphin joined Dive and Sea Tenerife with some of it’s divers. Drop by our site for more pictures. Another unusual experience…. with a Jelly!! Large Jelly found whilst diving in Tenerife with Dive and Sea Tenerife. Approx 45 cms long and completely transparent.